Over a billion people living in the Hindu Kush Himalaya region, including some parts of India, confront the threat of climate change's impact. The report can be accessed here (external link). David Molden, who heads the Kathmandu-based International Centre for Integrated Mountain Development, explains to M I Khan -- in a recent conversation in Kathmandu -- the seriousness of the threat of global warming-induced environmental changes in the climate-vulnerable the Hindu Kush Himalaya region and how to face it. The ICIMOD works in eight South Asian countries: Afghanistan, Bangladesh, Bhutan, China, India, Myanmar, Nepal and Pakistan. As South Asia has about 40 per cent of the world's poorest people who will be most affected by the ramifications of climate change, it is an issue of concern for all. Most of the poor people in the Hindu Kush Himalaya region live in flood- or drought-prone areas. And most of them are dependent on agriculture and the environment for their livelihoods. How serious is the threat climate change poses to the Hindu Kush Himalaya region and South Asia, in general? It is getting critical in the sense that we can see what's happening in the region that extends from Afghanistan to Myanmar. 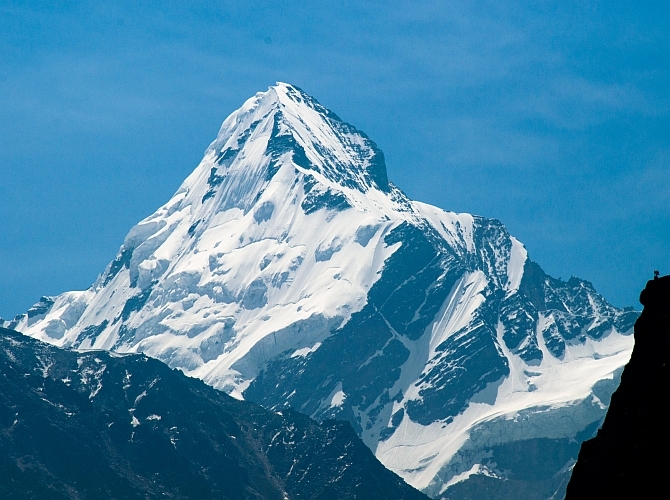 Since temperature rises faster at heights, mountains are highly vulnerable to climate change. And the Hindu Kush Himalaya region is the hotspot for climate change. In fact, we've already started to witness the affects of climate change. Glaciers are melting all across the region. It has impacted hydrologic systems and certain people living next to the glaciers, like in Ladakh, are facing it. This is a huge early warning of climate change. By the way, mountain people add very little to emissions, but bear the brunt of climate change (the most). Going by the ICIMOD study, people in the mountains of the Hindu Kush Himalayas feel the impact of climate change much more than those in the plains. One after another research studies by experts have established that people in the mountains release very small amounts of green house gases. This doesn't cause the problem of global warming, but they become its victims. Most of the people living in mid hills and other parts in the Hindu Kush Himalaya region are facing changes in the weather pattern and change in water system and farmers have to respond to those changes. Moreover, (South) Asia, of course, depends a lot on the monsoon, so it is quite big what is happening with the monsoon pattern. The model tells us that in future there will be more rain in a year than what we are getting now. It may sound good. But the bad news is that we will be getting intense rainfalls and heavy downpour in a short period of time, which will result in drought reoccurrence even as the annual volume of rain may go up. So we have to prepare for more floods and droughts. Ironically, it is the poor people, as we saw in the devastating floods in South Asia, who are mainly hit by it. Will all this hit the rivers of the region? Certainly, all this will change the river water system in Asia. Water is already a serious issue. The changing patterns of these rivers will have its impact. It will be witnessed across Asia. We have to prepare for it and tell the world that we need some action on climate change. In Asia, we have 10 river basins that come from the Hindu Kush Himalaya region that provide water, ecosystem services and livelihoods to more than 210 million people. These river basins are also home to about 1.9 billion people -- a fifth of the world's population -- living downstream. The basins of these rivers provide water to them. Comprising Afghanistan, Bangladesh, Bhutan, China, India, Myanmar, Nepal and Pakistan, the Hindu Kush Himalayan region extends to 3,500 km across eight countries. It is the source of 10 large Asian river systems -- the Amu Darya, Indus, Ganges, Brahmaputra (Yarlungtsanpo), Irrawaddy, Salween (Nu), Mekong (Lancang), Yangtse (Jinsha), Yellow River (Huanghe), and Tarim (Dayan). You are saying that water resources from mountains are important for the people below. Look, people in cities and on plains are causing the problems and they should think seriously about helping poor communities of mountains cope with climate change. Water resources are important not only for the people living there, but also for people outside the mountains. Mountains are important for the eco-system and bio-diversity. What are your views about climate change vis-à-vis India? How serious an issue is climate change for India and how to address it? Climate change is as serious an issue for India as it is for others in the Hindu Kush Himalaya region and across the world. India has taken two actions under its mitigation and adaptation efforts. India is moving rapidly towards renewable energy and energy efficiency. I believe India is moving in the right direction. However, India has to pay a lot more attention to mountains because mountains are neglected. India can lead the way and work with other countries of the region to tackle the problems of climate change. NITI Aayog members have shown their commitment to address climate change issues. It is said China and India are two major polluters in the Hindu Kush Himalaya region and both contribute to global warming. Both India and China have huge populations and growing economies. One can't compare them with Nepal and Bhutan as far as action plans on climate change is concerned. India and China are taking steps to face it. There is collaboration between them on this front. Why is the main focus on 'climate resilience' to tackle climate change globally? Resilience (the capacity for a socio-ecological system to absorb stresses and maintain function in the face of climate change and adapt, reorganise, and evolve into more desirable configurations to be better prepared for future climate change impacts) is the future of the climate-vulnerable Hindu Kush Himalaya region and more so for extremely vulnerable mountain communities, as far as mitigation of the exacerbating climate risks are concerned. Mitigation and adaptation should be focus across the world. Climate change in the Hindu Kush Himalaya region is unfolding at a much higher pace, posing grave risks to the sustainability of lives and livelihoods. Environmental change drivers in the region have already begun to impact ecosystems and communities and often manifests in communities through an increasing vulnerability and exposure to natural disasters such as floods, droughts and landslides. We need to diversify our efforts by organising women's group for flood and agriculture. Let us hope for a change. Though mountains are without boundaries, it is not possible in my lifetime.